Cryptomundo » Mystery Photo: Nazis & Yeti or Bizarre Bear? 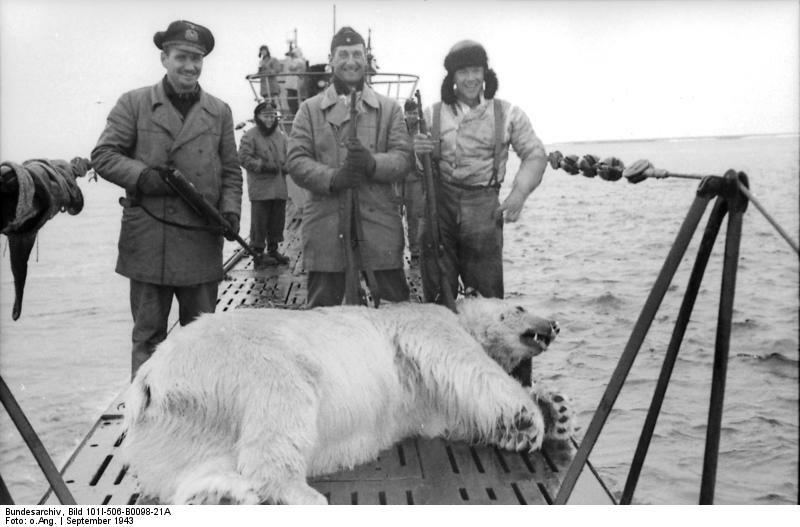 Mystery Photo: Nazis & Yeti or Bizarre Bear? I’ll get to the mystery photo in a minute. First a personal note about why today is special to me. As it turns out, today, September 25, 2008, is the 15th anniversary of my near-death experience, when I fell 40 ft while rockclimbing without ropes, and nearly died. My L1 vertebra was burst and had to be reconstructed with bone grafts from my pelvis. I now have a fused section of vertebrae in my ischis (spinal column) above and below the area of my reconstructed vertebra. I was in the hospital for two weeks, and it took five months for mobility recovery (vs what the doctors’ predicted, nine months). Although I have permanent pain in my back and cannot exercise the same way I use to, I feel rather flexible. And I’m alive, and I thank every extra day I get to see my sons and get to chase cryptids for that. Oh, cryptozoologically, the rockclimbing was about exploring and being outdoors. I was wearing a Yeti tee-shirt at the time. I’ve never worn that one again, but you know I saved it, of course, for the Abominable Snowmen collection. The incident assisted me in reassessing my life, and moving away from academia into pursuing cryptozoology fulltime, and indeed, in setting up the museum too. So here I am. Still around, after Yetis. Now that the “MonsterQuest” broadcast of the Mystery Bear episode has come and gone, this seems like a good time to bring up the following photograph. It was posted a few weeks ago on Henry Stokes’s “I Love the Yeti” blog. No info is available about it. It was found on the Internet. That’s it. The blog rightfully questioned, “Is that [a] Yeti with those Nazis?” But I think the critter (with that nose and ears) looks more like a weird bear. Well, actually, of course, it looks more like some ritualistic Thule (hint, hint, polar bear suit) activity or recent stunt during a movie. Is this for real, whatever real means? Does anyone know the source of this apparently cryptofictional picture? The photograph shown directly above supposedly demonstrates that a cryptid was captured by a group of Civil War soldiers, circa mid-1860s. It has been circulated as the “mystery Thunderbird photo” and/or by others as 1860s soldiers with the remains of a pterodactyl. The photograph was a hoax, using Civil War reenactors and a “pterodactyl” created as a prop exclusively for two episodes of “Freaky Links.” This “pterodactyl” itself is actually now part of the International Cryptozoology Museum. Photograph used with permission of Gregg Hale, Executive Director, Haxan Productions. Credit Haxan/Fox TV. This entry was posted on Thursday, September 25th, 2008 at 6:53 am and is filed under Abominable Snowman, Conspiracies, Cryptomundo Exclusive, Cryptotourism, CryptoZoo News, Cryptozoologists, Cryptozoology, Megafauna, Photos, Replica Cryptia, Television, Thunderbirds, Weird Animal News, Yeti. You can follow responses via our RSS 2.0 feed. You can skip to the end and leave a response. Pinging is not allowed. Umm, it is clearly a guy standing there in a bad polar bear outfit. Men, arm in arm, perma-smile on the head of the bear. come on. Bears have long been a symbol for Germany and especially the Nazis. The “Nazi Bear” in this photo looks like a man in a bear costume posing with his comrades. That’s even if the photo is real. The quality makes me think it’s a recent photo. I agree with the first two posters, looks more like a mascot costume rather than an actual animal. Agreed, modern photo and non standard rifles for the era, notice the length. More like WWI rifles, but with WWII uniforms? Nice smile for a bear though! There’s little doubt in most modern human minds that the Nazi photo is fake, and was taken within the last ten years. But, it is still a mystery of whether the Thunderbird was a Confederate or not. No Nazis would “recline” for a photo, especially with what looks like officers in the picture. That is a bad costume. I thought bears were the symbol of Russia and the former Soviet Union, not Germany and the Nazi regime. Without examining the original, I couldn’t say for sure but that looks like a contemporary picture attempting to appear older than it is. It’s subtle but the grain and contrast range seems finer than one would expect in a snapshot of the period and place and the exposure is dead on. Not that a knowlegeable Nazi couldn’t have been behind the lens but couple those subtle nuances with the almost comic expression of the 7-11 slushie polar bear… It’s just funny looking. Reenactors tend to be on the chubby side, not as fit as these guys look, so I think this is a real photo. Clearly a guy in a bear suit though. Note that the ‘bear’ is the same height as the soldiers. my first thought was werewolf, but it’s definitely a bear. he has a huge grin on his face because he is about to eat those two plump nazis lying on the ground in front of him. seriously, very weird picture.i would guess some sort of cast photo from Blondibear and the Three (er, Nine) Nazis? A most amusing hoax. The bear looks to be having a good time. OceansBlue, they are indeed WWII uniforms and WWI rifles; the German Army basically used variants of the same rifle in both wars. I have to wonder why anyone, hoax or not, would want a picture of Nazis posing with a bear. Was the bear named “Schultz”? I saw this thing being auctioned off on eBay some time ago. I wondered who bought it. We are all glad you survived. You have enriched the field of cryptozoology! Please go to “More On So-Called ‘Nazi Bears'” for new photographs comparable to the above and for good insights on the possible background of these images. The pic is not a fake. In some parts of germany and alps region is a rite around easter to cast out the winter with a man masked as bear. The picture seems to show one of those “bears”. Nothing special. Not sure about this one. The rifles look like german sniper rifles but I can’t quite figure out what model. I’m not up on all the German WWII weapons and better at allied weapons or even German pistols rather than German rifles. The ones at the sides of the standing soldiers look right though. They appear to be more of a carbine. (yeah, I’m a bit of gun nut). But are the uniforms right? Don’t know. They almost look TOO good for a unit that had seen much action. Any WWII buffs out there? Nothing could be more descriptive, notice the Bear is at center in the prime photograph, this surely spells out the devious plotting of these White bears and their useful Idiots the Nazi puppets, this surely means bad times ahead, as this photograph clearly exposes the truth!!! Expect all sorts of misinformation about this photograph being an elaborate “fake” or a “joke” some of you will buy into it too! Suckers! The polar bear might be a guy in the suit, but I think I can see a shadow in the background brush that could be a Yeti. Neither a bear or yeti. Wolf, or Werewolf might be more like it. Copied the picture and upon enlarging it it is very easy to see a person’s head in the “mouth of the bear”. Also, a bear’s legs are much shorter in relationship to its body than a persons arms and legs. This bear’s “front legs” just happen to be proportioned almost identically to the men standing around it. Obviously a person in a bear costume.